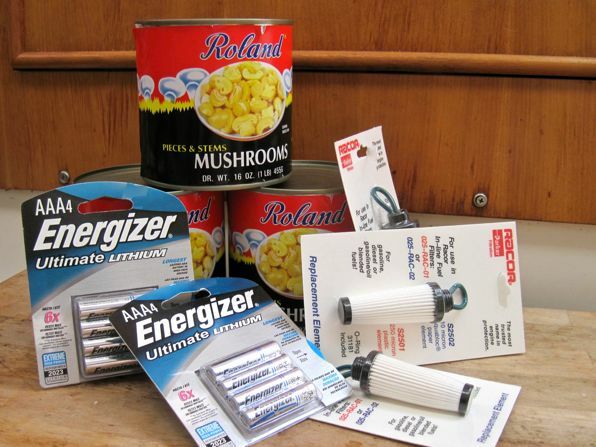 What do canned mushrooms, Racor filters and lithium batteries all have in common? They are things that we have either had difficulty finding or have been prohibitively expensive. We have often heard the advice that when you come across something that you need or like (boat spares, a favorite food product, etc. 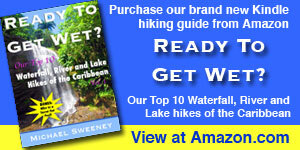 ), buy it. This, we have found, is good advice. In these particular examples, canned mushrooms have been available but we have often found them to be crazy expensive up and down the island chain. As for the other two items, they are just plain difficult to find. The little Racor filters, which sit in line before each of our boat’s two Yamaha engines, are extremely rare. Large Racor filters? You can get them everywhere. These little guys? Not so much. The lithium batteries, which we use in our Spot tracker, are equally hard to acquire. So, even though we don’t really need any of these things right this minute, we didn’t hesitate to snap them up when we came across them here in Sint Maarten. I know this will save us headaches and $$$ in the future. Note: When it comes to food, unless you are sure of the brand, I’d suggest purchasing a sample first before stocking up on a large quantity. We’ve heard of many people being disappointed after buying a dozen cans of a particular food product only to find out that it didn’t quite taste as they had expected. Next PostAre you a desperate sailor? What might your budget be for food? And what do you find readily available and reasonable in terms of cost etc…????? Expensive = more than double the cost in the US. As for budget, great question. In your travels, where have you felt the cost of living is the best as far as lunches, drinks, etc…..
As I remember, St Martin is the “go to” island for all provisioning in general. There does seem to be places for everything here. Why don’t you replace filter housing to more common one? That is an option but I don’t like messing with things that work. I assume the boat’s engineers knew what they were doing. Unfortunately it is not true. They usually use whats easily available (for them). Remember that batteries have a self-discharge rate. It’s less for litium than for others, but even new batteries from an unopened pack can be dead as the proverbial doornails. I’ll be honest, I’ve never seen those tiny Racors! Quick tip on those batteries (if you haven’t already learned it) — put them in a really good (leakproof) plastic container and then stick them in a back corner of the refrig. Heat really takes its toll on batteries and I had several go dead before I needed them — after I started storing them in the fridge, didn’t have a problem.